Wales' slim chances of qualifying for the 2019 Euro U21s Championships ended after a 2-0 defeat to 10-man Portugal. 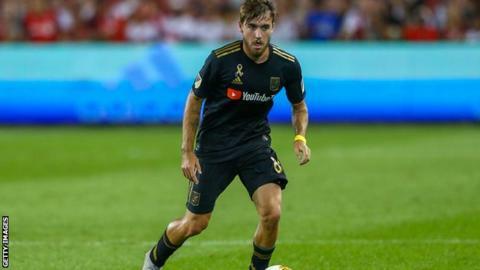 Los Angeles FC midfielder Andre Horta gave Portugal the lead on 35 minutes with a sumptuous long range effort. Wales sensed a route back into the game when Yuri Ribeiro was sent off on the hour after a second yellow card. Rabbi Matondo came closest to finding an equaliser but twice missed the target before Joao Felix's deflected shot made the result safe. Wales remain fourth in Group 8, trailing leaders Romania by eight points and are also eight points behind second placed Bosnia-Herzegovina, who were knocked off top after losing 2-0 to Romania. Portugal extended their advantage over Wales to six points. The group winners qualify automatically for next summer's finals in Italy and San Marino, while the four best runners-up among the nine groups advance to the play-offs. Robert Page's Wales side had kept alive their slim hopes of qualifying with a 2-1 win over Liechtenstein on Friday, Wales lost 2-0 in Portugal last September in the reverse fixture. "I was really proud of the players tonight they gave a good account of themselves, some of our performances were excellent," Page told BBC Sport Wales.